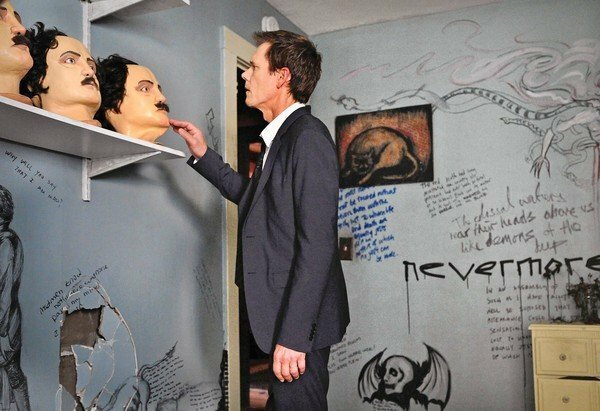 The Following – I Love Splatter! I was so excited when I heard about the bunches of new horror TV shows following the success of American Horror Story, especially about The Following—starring one Mr. Ren McCormack Kevin Bacon. A handsome, charismatic serial killer who uses the works of Edgar Allen Poe as inspiration for his murders and the basis for his cult? A band of unhinged followers willing to do whatever it takes to earn and keep his love? And a defeated ex-FBI agent still entangled in his mess? Created by Kevin Williamson??!?!? COUNT ME IN. But while I thought the pilot was pretty strong, The Following disintegrates a little bit more with each episode, and it’s starting to lose me. The killer, Joe Carroll, is played by James Purefoy, which is honestly enough for me to believe that hoards of people would sign up to be his worshippers. Okay, okay, I kid. At some point the show seems to have forgotten why people are totally willing to carry out Joe’s “work”—and the flashbacks to his college Prof days aren’t really cutting it as a believable explanation. And while the Poe reference is interesting, it’s not necessary to have your FBI investigators repeat “That’s Poe” after every single quote, piece of graffiti, poem, drawing, statement—whatever comes up. We know it’s Poe. You said it’s Poe. Carroll only uses POE. NEVERMORE you guys. NEVERMORE. Bacon’s character, Ryan Hardy, is set up from the get-go as an alcoholic mess … who is constantly disheveled. He’s the agent who caught Carroll originally (and got a pacemaker because of it), and became romantically entangled with Carroll’s wife after his incarceration, but he nobly left her so she could forget about her past. Yes, because it’s super easy to forget your husband is a mass murderer, especially when you have a son with him. They’ve switched directions a little since the first episode and have thrown the focus off young computer expert agent Mike Weston (Shawn Ashmore) and onto more seasoned agent Deborah Parker, who specializes in cult mentality, because, as we learned in an extensive flashback, she was IN a cult when she was young. DID WE REALLY NEED TO GO THAT FAR? I don’t think it was really necessary, no—unless later on it turns out she was in on with Carroll the whole time. But that’s dumb. Don’t do that, writers. Okay? And they brought in Caroll’s trial lawyer, who is apparently terrified of him because he sent a follower to cut off a couple of her fingers way back when she tried to stop being his lawyer. Wait, what? She’s a trial lawyer. Presumably for dangerous criminals, all the time. But for some reason, instead of reporting this, she just rolled with it and now she’s this guy’s slave forever. Hmm. Lest this sound like I hate everything about it, let’s get to what I do like: Carroll follower Emma (Valorie Curry) whose pixie hair and innocent face juxtapose brilliantly with her psychotic, mom-killing urges; Roderick (finally, a follower with some depth! ); and Carroll’s ex-wife, Claire Matthews (Natalie Zea), who can express a multitude of complex emotions in one look, and the brutal, sometimes unexpected killings that happen during the course of an episode. They’ve got the blood and gore down; they just need to work on making me care about what’s happening. However. Where it’s losing me is that the writers a) don’t seem to have any focus and b) seem like they’re getting kind of lazy. At any point in time, it seems like they pull out the “this person is a member of the cult! SURPRISE” device to further the plot. As in, that’s the ONLY thing furthering the plot. The other device that’s quickly going to become overused is that even if someone is not a Follower, Joe can manipulate them into doing whatever he wants by having a group of Followers kidnap a loved one and hold them until he gets his way … like, with the warden of the prison. WAIT. WHAT? That makes even less sense then the lawyer. When it’s good, the writing is really, really good (re: the ice pick, the creepy Poe masks with a guy standing next to them and wearing one, that one dude’s wife being all crazy and unhinged, the love triangle between Emma, Jacob, and Paul). But that’s why when it’s not, it’s so much more obvious. You can’t just mash-up a Hannibal/Manson storyline and not work at it, other than paying attention to how gruesome you’re making the murders (special shout-out to the set dressers and F/X people on this thing; you guys ROCK). There needs to be more to keep my interest. Because I’m a completest, and I’ll watch nearly anything having to do with a serial killer, I’ll hang until the end of the season. But if it continues like this, I won’t be surprised if it doesn’t get a renewal. And I won’t be sad to see it go. Here’s hoping both the upcoming Hannibal and Bates Motel are better. I am enjoying Kevin Bacon’s performance but I am so, so tired of every single cop on the force suddenly being exposed as.. gasp.. a Follower!! It’s pretty lame! And so disappointing. Come on, you guys. I know you can write something better than that. Kevin Bacon is doing a great job on this show! The picture you placed at the top of your article, crazy! That scene scared me to death.